Françoise Cluzeau PhD is Associate Director of the Global Health and Development Group at Imperial College London, responsible for strategic oversight of the programme. 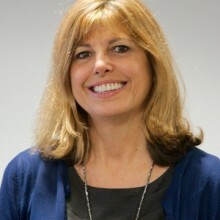 Françoise leads on several projects related to clinical guidelines and quality standards worldwide, including in India, Vietnam, Ghana, Thailand and Sri Lanka. She has worked with the Ministry of Health in Turkey, Georgia, Brazil, China, Kenya and Tunisia in the context of their Quality Improvement Programme. She led the international AGREE collaboration of 19 countries that originally developed the AGREE Instrument and was a founding member of the Advisory Group for the Guidelines International Network (G-I-N) and also has five years’ previous experience working in Africa on demographic and public health projects with universities and international agencies. A psychology graduate by training, she holds a masters’ degree in medical demography from the London School of Hygiene and Tropical Medicine and a doctorate in Health Services Research from the University of London. She is an honorary Senior Lecturer at King’s College London.